Note: this is a commercial product and not open source. Please report bugs and problems through Issues. 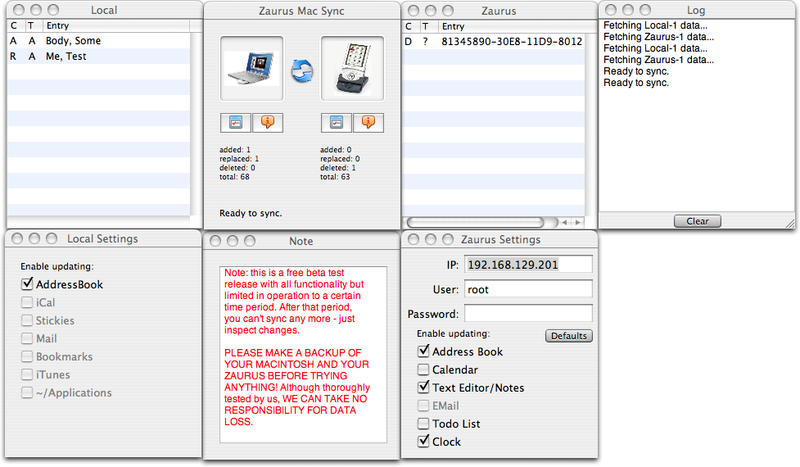 ZMacSync is a tool to easily remotely access Linux Handheld devices like the Sharp Zaurus and Openmoko mobile phone from Mac OS X. For some models this includes at least unidirectional synchronization of the Address Book, iCal calendars and to-do lists, as well as Stickies (notes) and the system clock. Synchronization is optimized so that only records are interchanged that are added, modified or deleted with as low data transformation loss as possible. ZMacSync shows a reminding message on each sync that you please should purchase a Shareware Key. As soon as you purchase and install the key, this message will disappear. This also includes updates and upgrades. The personal Key can be purchased at our shop and is distributed by E-Mail. To install the key, open the About... dialog and select Purchase. Then, use the Add button to create a new entry. Copy&Paste the key from the email and Close.